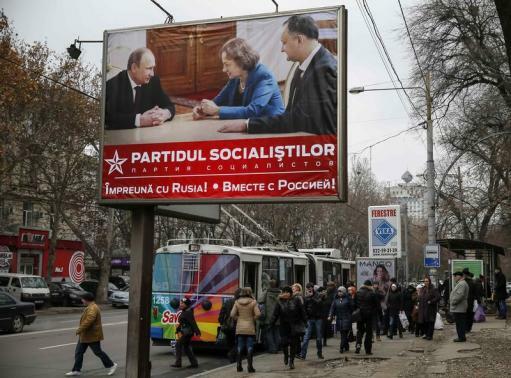 People in Moldova are heading to polls to vote in parliamentary elections which are widely seen as a contest between pro-EU parties and those backing closer ties with Russia. Recent opinion polls gave a lead to the pro-Westerners, but tough post-election bargaining is predicted. On the eve of the vote, one pro-Russian party was banned from the poll – a move criticized by Moscow. The elections have taken on a wider significance in the shadow of the bloody crisis in neighboring Ukraine. The crisis began last November after Ukraine’s former leadership made a last-minute U-turn, refusing to sign a landmark association and free trade deal with the EU – under huge pressure from Russia. This triggered mass protests in Ukraine that ousted President Viktor Yanukovych, and Kiev later signed the EU deal. But the protests, in turn, led to Russia annexing southern Crimea peninsula in March and throwing support behind separatist rebels in eastern Ukraine. Moldova – which also signed the EU agreement – has been under growing Russian pressure to change course. About 2.7 million people are eligible to cast their ballots, electing a single-chamber 101-seat parliament by a system of proportional representation. However, residents of the Russian-backed breakaway region of Trans-Dniester are not taking part in the election. Moldovan PM Iurie Leanca’s Liberal Democratic Party wants the country to achieve EU candidate status by 2017 and full membership by 2020. Its coalition partner, the Democratic Party, is more moderately pro-European. The most strongly pro-EU and pro-NATO party, the Liberals, left the ruling coalition and went into opposition last year. The opinion polls predict that the three pro-Western parties may get up to 43% of the vote. The main opposition party is the Communist Party – a Soviet-era survivor that still uses the hammer and sickle as its symbol. Poll ratings of another pro-Russian party – the Socialists – have been recently boosted by its populist campaigning, including concerts by Russian pop stars. Pro-Moscow forces are also expected to pick additional votes after the ban of the Fatherland party. It was barred from the elections on the grounds that it illegally received foreign funding. The party – whose leader has fled to Russia – denies the claim. The opposition also hopes to capitalize on the growing economic problems under the pro-Western government in Moldova – one of Europe’s poorest countries. The situation worsened after a Russian ban on Moldova’s import of agricultural products – including wine, meat, fruit and vegetables.